94% of our orders arrive the next working day. Want it next day guaranteed? Choose Express Delivery at checkout. Vegan supplements, Vegan vitamins and Vegan Minerals. We are at the cutting edge of supplying you with the very best supplements & vitamins money can buy. Our Vegan vitamins are Guaranteed to contain No chemicals and only contain those ingredients that make our supplements work. No bulkers, No fillers and No other chemicals to stabilise the formulations. All our vegan supplements are sold without the chemicals that the majority of our competitors use to bulk out there supplements. Our safe vegan vitamins are sold with the full spectrum of nutrients which offer you a step above the rest. Curcumin has been reported to diminish inflammatory cytokine production and both Curcumin and Gingerol have been demonstrated to suppress cox-2 expression. "People are looking to supplement more and more. They have less tolerance for the side effects of traditional pain medications. They want something different, safe, clean and natural". Comes in an easy to swallow gluten-free capsule. 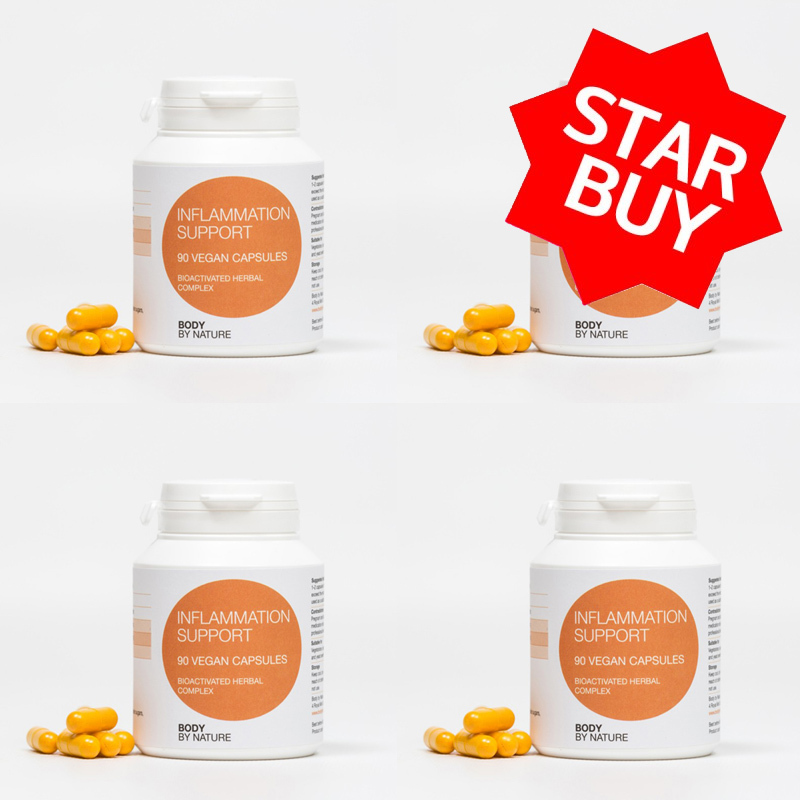 Inflammation is a complex defence and repair mechanism that is activated in response to challenge by infectious or allergenic agents, injury, disease, and even ageing. The botanical extracts in this formula work together to help prevent excessive inflammation associated with tissue damage and other causes of inflammatory reactions. Whether you are buying our supplements for Religious reasons, Ethnical reasons, Animal welfare reasons or you just want the very best supplements you can find for your money, here at Body By Nature we sell all our formulations in a Vegan format. Vegan Vitamins, Vegan supplements and Vegan minerals, are sold in a ‘whole food’ or ‘food state’. Your body recognises this and therefore each and every Vitamin and mineral will nourish and maintain areas of your body which needs it the most. Eco Packs - The same Supplements but with No Bottle! This link below allows you to purchase the same high quality vegan supplements without the need to throw the bottle away when you have finished taking the course. Our eco pip packs save you money, allow you to recycle all our packaging and keeps the waste to a minimum all the time you can be enjoying the very best natural ingredients money can buy. Curcumin, ginger root, capsule shell (hydroxypropylmethylcellulose), piperine. Vegetarians, vegans and for people with Candida and yeast sensitivities. Pregnant or lactating women and people on medication should consult a qualified health professional before using this product. Wheat; gluten; soy, yeast, starch, lactose; added sugars, colourings, flavourings and preservatives. Keep cool, dry and out of direct sunlight, keep out of reach of children. If seal is broken on purchase do not use.